In our latest article about Cinnamon, we told about tweaking. Now, we will give a basic guide about how to use Nemo. 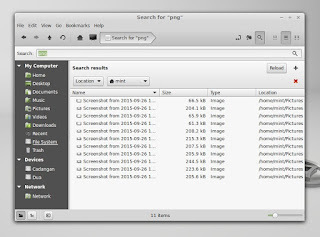 It is a file manager, a central part of Cinnamon Desktop and therefore a central too for Linux Mint (or any distro using it). 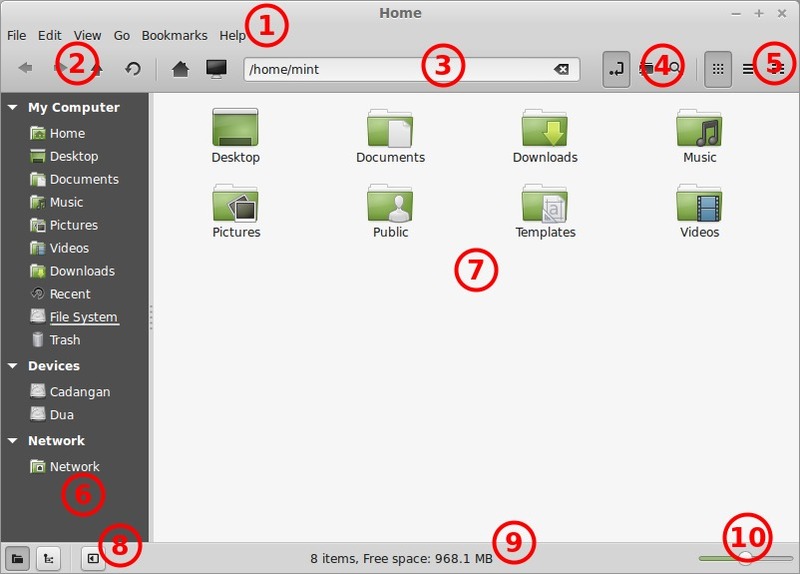 You will learn basic actions in Nemo just like using Windows Explorer or Mac OS X Finder. 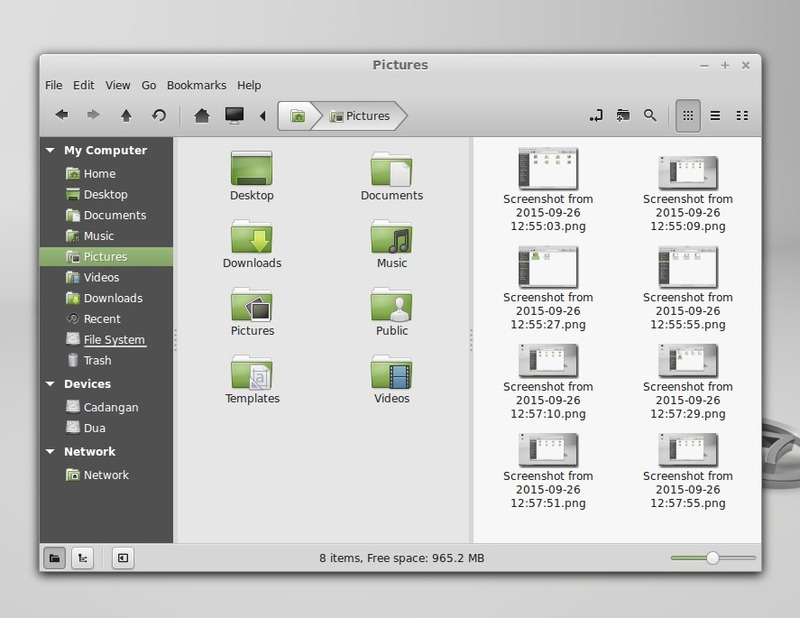 FYI, Nemo may installed on Ubuntu if you dislike to use Nautilus (Ubuntu file manager). Enjoy. 2. Toolbar (back, forward, up, reload, home, my computer). 4. Toolbar (address toggle, new folder, search). 5. View buttons (icons, compact, details). 6. Left panel (My Computer, Devices, Network). 8. 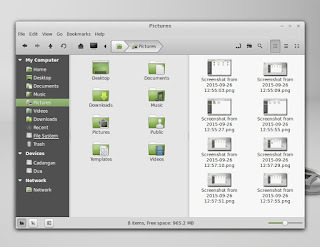 Bottom toolbar (Folder View, Tree View, Hide Left Panel). Nemo has same concepts in usage compared to Windows Explorer. But Nemo has same concept in visual appearance compared to Mac OS X Finder. Differences with Explorer, Nemo has Folder View default appearance in Left Panel. This is visually similar with Finder. You must enable Tree View if you want something like Explorer left panel. In Nemo, you can split main are into two. Press F3. This is very helpful when you are comparing two different folders at once. Nemo has multitab. Press Ctrl+T to open a new tab. In a new tab, you can browse different place. More tabs more places. It is just like web browsing with Firefox. To create new folder, right click on main area > Create > New Folder. Or, click new folder icon on top toolbar. Or, press Ctrl+Shift+N. To delete a folder, click/select a folder and press Shift+Delete. This will delete folder and its content permanently. If you want to delete it temporarily (move it to “Recycle Bin”), right-click and select Delete. Or, just press Delete without Shift key. Nemo has default Breadcrumb address bar. It's similar with Finder after all. It is an address bar with clickable button for every folder history. If you want normal address bar, press Ctrl+L. To revert it into Breadcrumb, press Ctrl+L again. If you are using Folder View, you can bookmark your favorite folder there. Just drag and drop your folder into Left Panel on Devices section. This is something similar with your Left Panel appearances on Windows. You browse folders by parent and child view. To enable this, click Tree View icon on bottom toolbar. In Nemo, you can sort your files appearances by Date, Location, Name, and Size. To mount (open) external device e.g. USB flash drive, plug the device and click on its name on Devices section on Left Panel. To unmount (safely remove), click on eject icon on its name. Nemo hides hidden files by default. To show hidden files, press Ctrl+H. To hide them again, press Ctrl+H too. To search files, press Ctrl+F and type what do you want. In newer version of Nemo, it has incremental search. So, the results come directly. Doesn't wait to be finished first to show the result.